There’s hardly a day when the Galle Face Green isn’t peppered with families, power walkers and the smell of isso wade. But if you stopped by the Green over these last two months on a lazy Sunday morning, you would see energetic crowds lining the shoreline, ready to embrace the bracing 6 a.m. sea and the 1.9 km swim they exuberantly take on in preparation for Ironman 70.3 Colombo, to be held later this month. The Ironman brand began in 1978 and has progressed to become the largest participation sports platform in the world with over 260 events across 44 countries. Ironman 70.3 Colombo will begin with a 1.9km ocean swim followed by a 90km bike course ending with a final spectator friendly 21.1km run. By 9 a.m. the swimmers are back on the shore, tired but smiling, exchanging high fives, a few selfies and chit chat with newly-minted friends. But the swim doesn’t seem to be enough for some participants who scale the ladder (which to us bystanders looks more like part of the challenge) to the Green where they then do a few practice runs. Five men in particular stand out: a pair seated on a bench, putting on their sneakers and a trio that swam together now jogging arm in arm. #challengeyourlimits is one of the event’s trending hashtags and it’s a slogan all five of them seem to embody, each one on their own journey to challenge their limits. Seated on the bench overlooking the sea, 30-year-old K.M.Shashi Madushanka admits that the very first practice swim shocked him. “It must have been the cold,” he says. Shashi is one of three visually impaired participants taking the full Ironman course- swimming, running and cycling. While Ironman is a new experience for Shashi, he takes to the ocean almost instinctively, having swum since he was around 12-13 years old. A masseuse specializing in “Anma”, a type of deep tissue therapy, Shashi’s interest in water sports was cultivated by his talented older brother while they were studying at S. Thomas’ College, Gurutalawa before transferring to St. John’s College. “I wanted to be better than him,” he says with younger sibling logic, and used to join his brother at the Kinross Swimming Club where he received certificates in lifesaving. Shashi excelled at inter school meets as well as open water competitions even securing a job offer as a lifeguard abroad at the age of 22. But in a twist of fate, his job offer coincided with a devastating trishaw accident which sent an iron bar into his eye, later resulting in the loss of his sight. For the two-man team, their partnership goes beyond training. “We take care of each other,” Asanka adds, seeing Ironman as a chance to inspire others to challenge their limits. The same sentiment seems to follow Inoj Shaki Edirisinghe and Khalid Oshman who together with Denis Crassier run linked together up and down the Green. Khalid’s story begins in Kuwait where he was born. 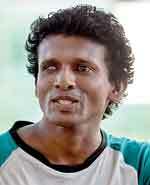 Having never known his birth parents, the then fully sighted youngster was raised by Sri Lankan parents. His vibrant personality and passion for service shines through as he talks about his experience working with the Sri Lanka Red Cross as a first aid coordinator and later youth chairman. In 2010, an accident robbed him of his eyesight and his spirit. “I didn’t want to come out of my room,” he remembers, adding that he isolated himself for about three months. It was his cousin, Siddeek Akbar, who kept talking to him and encouraging him to start anew. 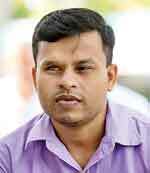 He joined the Sri Lanka Council for the Blind. The mobility training which usually takes a year to master, he picked up in a week. “I realized how differently we were being treated,” he says, wanting to break the stereotype people associated with the visually impaired. Soon after, he began swimming for the first time. His new life found him on the cricket pitch as well, competing in the 2017 Blind T20 World Cup and walking for “Sight for Life” and TRAIL’s ‘trailblazers’ last year.He also wanted to “get back in the system” and applying to around 40 companies, faced countless rejections before being accepted by Dennison Lanka (Pvt.) Ltd and Sri Lanka Aviation College- where he currently works in marketing, supported along the way by General Manager Primal De Silva. 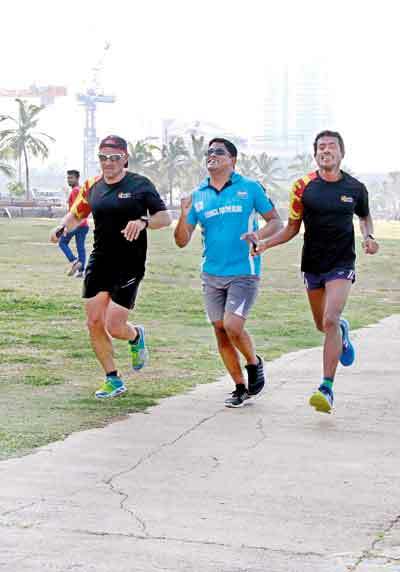 Perhaps it was the “fighting spirit” that his coaches Julian and Denis would later see in Khalid or maybe his own unbending attitude that found him approaching Lt. Col Bandula Weragama at work about Ironman 70.3 who introduced him to Denis from the Triathlon Club Colombo. He asked his swimming coach Julian Bolling if he could swim for the event, and both Denis and Julian were convinced by his motivation as was his friend Lakmali Kahawatte; who supported him throughout the practice swims. Swimming and running side by side with Khalid and Shaki, French expatriate Dennis Crassier who has been training them since January, was also led to Ironman through an unkind twist of fate. In fact, triathlons are a recent fixture for the rugby scrum half whose career spanned 20 years. At the age of 31, he ironically suffered a heart attack while on his beloved turf. “I was at the peak of my fitness,” he remembers, and the slow struggle to rebuild his body and mind saw him kiss his passion goodbye. An active man, he took up running as a hobby, but the lonely sprints were alien to the team player. “In rugby we have a fighting spirit, but to do it alone is hard.” Wanting to get back to the sport in some way, he became a certified referee, manager for a rugby club and coached for a while. While working in Chicago, he discovered an ideal training spot close to Lake Michigan; where his triathlon adventure first began. At the age of 43, he competed and completed his first Ironman. “It was an achievement for me” the weight and worry over his health finally lifted. Following his move to Sri Lanka two years ago, Denis looked around for a sport to get involved in, “it’s the best way to adapt to a country” he shares. His search led him to the newly established Triathlon Club and a group that would become his Ironman family. “I trained alone for the first time, which was a mistake.” A strong mindset and a strong support group; which he has in his wife and like-minded friends being the most essential factor for any participant, he says. The support group grew in January when Lt. Col BandulaWeragama called him about a colleague who wished to train for the event. “It was the first time I worked with a differently abled athlete,” but when Denis and Khalid first met; the former knew he was the real deal- “It was the first time I saw such motivation. Khalid had the fighting spirit”; a phrase that has rubbed off on the others as well. The trio’s first swim was Khalid’s first swim in open water after losing his sight. “There was panic” followed by Denis pushing him only at the start before the three finished it, heading back to the shore arm in arm. Ironman 70.3 Colombo will take place on February 25. Letting you in on a little secret about our small cats!